In line with our growth ambitions, we are focusing strongly in exploration. We are pioneering in the use of the latest technology in the field in order to be sustainable and efficient in our exploration. For example, in exploration on the Karelian Gold Line in Finland we have digitalized our exploration and are using 3D modeling and artificial intelligence (AI). Samples taken from the terrain are analyzed digitally so that a realistic picture of the concentration of gold can be obtained. In our project we employ the latest digital metering and AI technologies to develop computational joint interpretations of large data sets compiled from geological deep drilling samples. These interpretations are also combined with other results collected with different methods to create a 3D modelled view of the characteristics of the terrain. Endomines has decided to report the mineral resources in accordance with the Australian JORC code or the Canadian National Instrument (NI) 43-101. Swedish and Finnish organizations in mining industry, SveMin and FinnMin, support these standards. The Company has also chosen to make the mineral resources transparent through qualified, independent and international consultants who conduct the mineral and ore estimates using a standard that is valid on the Canadian and Australian stock markets. The Company has chosen this strict strategy to increase the reliability in reported results considering the mineral resources and ore reserves. These are the foundation stones for the Company’s future plans. This also makes international comparisons with similar companies possible. A mineral resource is a concentration of inorganic or fossil organic material in or on the Earth’s crust in such form, quality and quantity that it has reasonable chances of being economically extractable. Mineral resources are divided into ascending geological categories: inferred, indicated, and measured mineral resources. 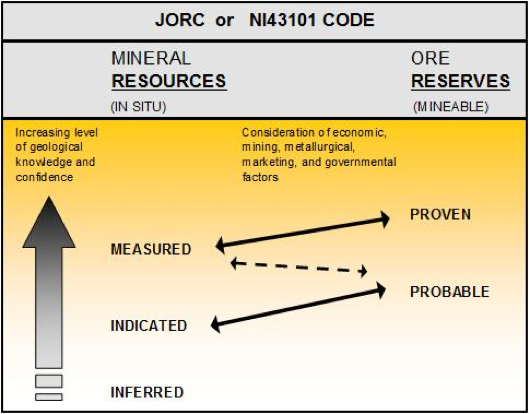 An inferred mineral resource is categorized lower than an indicated and measured mineral resource in terms of the level of geological knowledge and confidence. The location, quantity, content, geological characteristics, and continuity of a mineral resource are identified, estimated, and/or interpreted based on specific geological, geophysical, and geochemical surveys. The term “mineral resource” includes mineralizations and natural materials of actual economical interest that have been identified and estimated through exploring and sampling. The ore reserves (of mineral resources) can be defined by technical, economical, legal, environmental, socio-economic and societal factors. Under the JORC code, the term “reasonable prospects for economic extraction” means the judgement of a competent person on the technical and economic factors likely affecting the prospect of economic extraction. A mineral resource is a realistic inventory of mineralization which might under assumed and justifiable technical, legal and economic circumstances become economically extractable. These conditions must be introduced both in public and technical reports.